Thanks for your reply. Unfortunately I think it's one of those things I would have to see in person and try to trust it. I've been trying to find an integrated bike that will let me hit my reach numbers and my first choice is a speed Concept in a large as they list the reach that you can hit as 584.but when you get to the nuts and bolts of it it's actually a completely unattainable number. Whoever came up with that chart and that number did not spend any real time on that damn bike. Totally understanding your concern. I managed to go downstairs and lo and behold, a SLX that's in triage has the team switchplate. I decided to create a selection of shots here: the standard switchplate (shown in the first two frames without pad cradle and with pad cradle in its most fore position) and the team switchplate (the final two frames) shown without pad cradle and with pad cradle in its more fore position. I measure 40mm of added fore positioning (and since this piece is flippable, it can be flipped backward—or inward in that fore or aft position—in any permutation you choose. As you can see, the team switchplate offers a ton more fore/aft and width adjust variance to your pad placement. Hope this helps illustrate the variability in pad placement/reach capability. Has anyone tried a PR Qbox (or alternative) on the seat post mounting points? What is the stem angle on the 80mm stem that came on my medium? Did you have to change much to get this set up to work? Did you have to change the stem, base bar etc? Are there any experiences for getting the arms more narrow on the Speedmax CF? That's like the only downside I can see about this awesome bike. Can someone confirm that other armrests get the arms close together like the Profile Design Ergo? Is that narrow enough? It's roughly 7 cm apart (edge to edge in narrowest place) and 17 cm center to center. Great pics, thanks! Could you get it even narrower? Seems like 1cm is left on each side right? Satisfied with the PD Ergo? Because the Speedmax CF uses a standard stem with a 31.8 clamp, you can remove the stock basebar and put on a one-piece bar, or leave the basebar and take off the Profile Design T4+ clip-ons (or the Profile Design 35A clip-os with subsonic brackets that now feature on the 2019 Speedmax CF) and put on any aerobar or clip-ons you want; Zipp, ENVE, 51 Speedshop's new bar, whatever. Find the narrowest pad setup you can find, load 'em up and you're set. Forgot to ask.. Which armpads are you using on the pictures? Are these the stock ones? Thanks! Thanks! 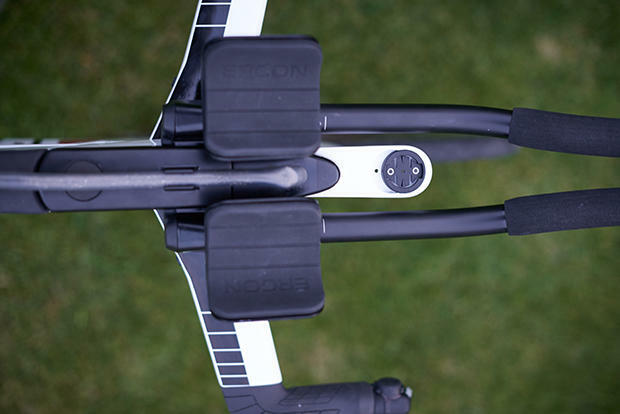 Do you happen to know if it's possible to get narrower with the same aerobars but different pads like the PD ergo pads? With the 2018 model people seem to have been successful in getting quite narrow with this small change cause it was actually only just the pads that were wide. Thanks!! I tossed my stock arm pads for the PD Ergo ones and was able to get much more narrow. I also tossed the long crank arms, but that's another story. The photo above is actually fit variability for the Speedmax SLX (I wish it lived in the SLX thread)... so they're Ergon pads, built for the Speedmax SLX. Cool! On the 2019 model or an older one? Here are some photos of my cockpit. Sorry about the quality, lightning isn’t the best in my pain cave in the basement. Haven’t had time to trim the rubber “thing” hugging the frame, currently there is some extra overlapping with the head tube. Thanks for the insights here. As a new Speedmax CF owner it's super useful. I had my Speedmax CF professionally fitted in the autumn (post season) and in the past few weeks I've been experimenting with set-up and comfort on the trainer. It's my first TT bike so obviously there's going to be a period of adjustment. The one issue I'm wrestling with is base bar width and elbow pad width. As currently set up (based upon the bike fit), the elbow pads obstruct the hands/arms when using the bullhorns. It's not impossible to ride with on the trainer but I wouldn't want to ride a long mountain climb nor tackle a fast descent on the bullhorns with what is an awkward and unnatural grip. I tend to seek out bike courses with lots of climbing as it suits my riding background. It seems to me that I have 2 options i) move the elbow pads and extensions inboard thereby narrowing the grip or ii) keep the pad spacing as per the bike fit and go for a wider base bar. Looking at many images of Speedmax set up (and TT in general) most seem to have plenty of room between the outside edge of the elbow pad and the bullhorns. I'm thinking that this might just be an issue which wasn't focused on in the original fit (although it lasted 3hrs there was a lot of other issues to set right)? I'm now experimenting option ii) to determine comfort in this narrower position. Wondering if any other Speedmax owners have experienced this with initial set-up and/or specific insights out there? —been observing the thread for quite some time and there are a couple of things I can relate to. Purchased my Speedmax CF 8.0 in September, and undergone a bike fit soon thereafter. Paul, I do seem to have the very same issue as you do. I’m quite fine with the base bar width, however due to the width of elbow pads, my grip is also obstructed. It was not possible to go narrower with the stock (PD F35) elbow pads—this is why I will be swapping them with PD Ergo or Race in March. My fitter also suggested not to go narrower as of now - this is due to the fact that my reach is shorter than it should be, and I will be replacing the stock stem with a PD Aeria Ultimate one (adding 2 cm to the reach). Wider elbow position with a shorter, 80 mm stem, facilitates breathing and I don’t need to be aero riding a turbo anyway. So... the H30 basebars is 41mm wide, measured center-to-center. Most bars (iirc) measure 40/42/44, so it's on the narrow side of medium width, by 1mm. That said, I think a lot of the challenge you're having with the pads is going to come with the Profile Design clip-on. The 2018 Speedmax CF has a PD T4+ clip-ons, and their narrowest width is 35cm. By contrast, the new 2019 Speedmax CF sees a spec change, with a Profile Design 35A with subsonic brackets. They also have greater pad width-adjust (and narrower cups). In short, if you have a 2018 bike, you'll likely have to remedy any issue with the pads hitting your forearms by getting into a different clip-on. I like the new profile spec because of both the pad width variances compared to the old one, but also the fact that it has less stack, so you can get lower. Do you happen to know the narrowest width of the 2019 model?